Today, Google announced a long list of updates to Gmail. The new features, which are beginning to roll out worldwide are focused primarily on security, artificial intelligence, and the incorporation of modern email features, some of which were first tested in the company’s Inbox app. Google has addressed phishing with new, prominent warnings in the Gmail update. For sensitive information, Google is adding a ‘confidential mode’ in the coming weeks that will let users set expiration dates for messages and even revoke previously-sent messages. Google is also implementing per-message level two-factor authentication, which requires authentication via text message. Finally, users will be able to preclude message recipients from forwarding, copying, downloading, or printing messages. Google is adding AI-powered functionality to Gmail. Nudging is a feature that will remind you of messages you haven’t responded to yet, so they don’t get lost. Gmail is also adding quick replies, which suggest responses based on the contents of the messages you receive. 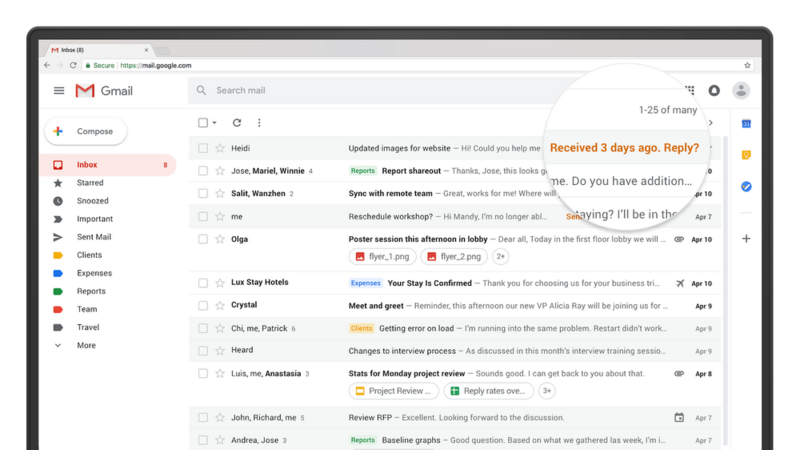 The web interface of Gmail is getting several new features too. There’s a sidebar on the right-hand side of the screen for quick access to several Google apps and Gmail Add-Ons from third parties. A hover-over menu lets users RSVP to meeting invitations, archive message threads, and snooze messages. You can also view attachments without opening the message to which a document is attached. A new offline mode is available too, which will be a welcome addition for travelers when an Internet connection is unavailable. 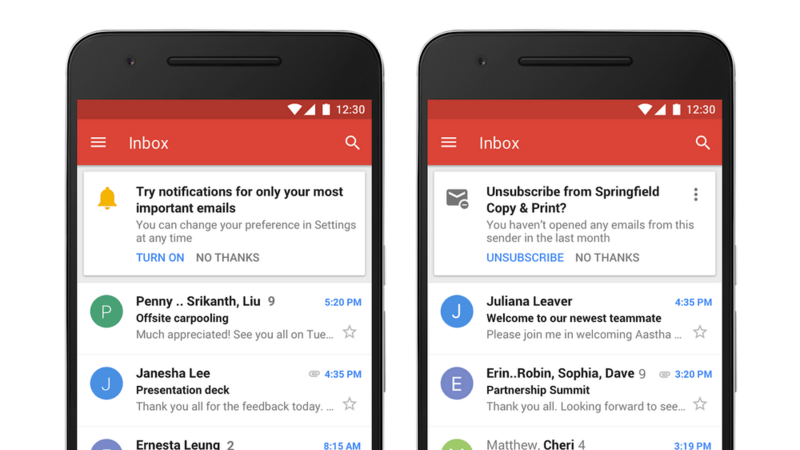 Most of the changes to Gmail are to its web interface, but a couple of changes are coming to Gmail’s mobile apps in the coming weeks including high-priority notifications that only notify users of important messages and a one-tap unsubscribe feature. Many of the new Gmail features are being rolled out globally in phases, so you may not see them right away. Google says others will be available in the upcoming weeks. Individual Gmail users can check the Settings menu for the updates and pick ‘Try the new Gmail’ to activate the new functionality. If you use G Suite, the new functionality can be turned on by participants in the G Suite Early Adopter Program from the Admin console.